Seattle, WA — Healthcare communication and collaboration company Telmediq has won the prestigious 2019 Category Leader award for Secure Communications Platforms from KLAS, a research and insights firm that gathers data and delivers reports on healthcare technology. 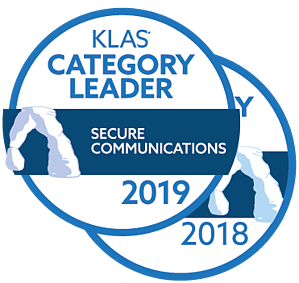 The honor, which is part of the “2019 Best in KLAS: Software and Services” report released today, marks the second consecutive year that Telmediq has received the Category Leader distinction. KLAS interviews thousands of healthcare professionals each year about the products and services their organizations use. This information is shared online in real time so other providers can benefit from the experience of their peers. The “Best in KLAS” report reflects data gathered over the past year. Telmediq, proud member of the PerfectServe team, is the 2019 & 2018 #1 KLAS rated vendor for secure communication platforms. Telmediq unifies communication by integrating 20+ clinical systems (EHR, schedules, call center, alarms, nurse call) to improve workflow and connect care team members. To learn more about the unique and recurring use cases of Telmediq in acute and ambulatory settings, download our Guide.